With two weeks to go until I am scheduled to start the 100km Haney to Harrison road run (at 4am I might add) it's time to focus on the final preparations. Tim, who has generously agreed to crew for me, and I are going to check out the course by car, so we can plan our meeting points along the course. Each solo runner needs a crew of at least one person who will be her moving aid station, with food and drinks along the way. This week I will focus on getting my body ready by eating healthy, drinking plenty of fluids, and taking hot baths and using the trigger point therapy tools we have at home to roll out tight spots. I will also focus my reading on the race. 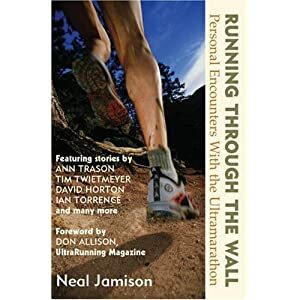 A couple of days ago I began reading the book Running Through the Wall: Personal Encounter with the Ultramarathon by Neal Jamison, a collection of stories about ultrarunners. First I am very much looking forward to checking out the course tomorrow, described on the race website as "Paved roadways following the scenic Sasquatch Drive. Starting in Maple Ridge, the course winds over rolling hills, passing through Mission and into the lush farmlands of the Fraser Valley en route to beautiful Harrison Hot Springs."